As a self-taught Spanish speaker, organizer of a Spanish conversation group and a conversational Spanish language coach, I get a lot questions from people asking for my advice on how to improve their conversational Spanish. Part of that answer is simply having conversations with as many Spanish speakers as possible, discussing a variety of topics and asking a lot questions. After all, it’s impossible to get better at conversation without actually conversing. But that approach can be difficult, stressful and take a long time for you to make significant gains in your conversational Spanish skills. Another practical, effective and more efficient approach to improving your conversational Spanish is by finding the right conversational Spanish books to supplement and help speed up the process. 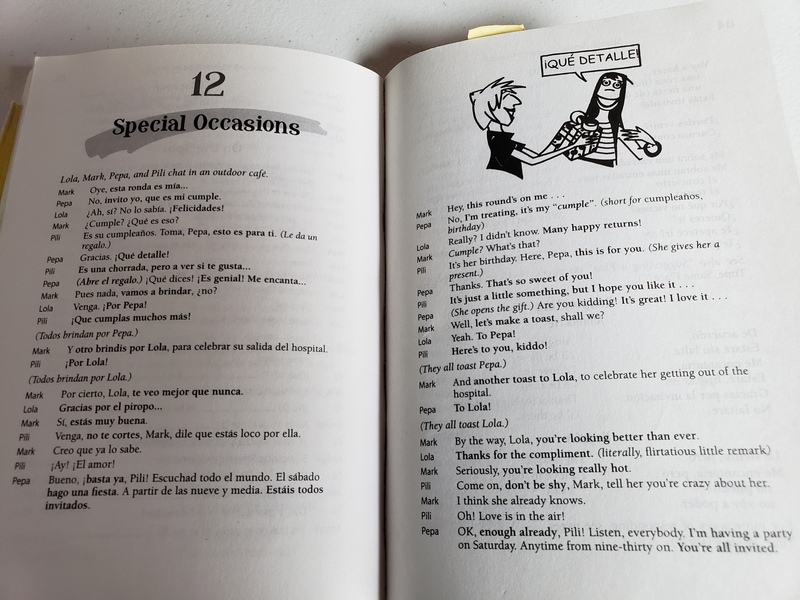 A good book on conversational Spanish will help you learn the most common vocabulary, expressions, idioms and language structures used by “común y corriente” (ordinary, average) Spanish speakers. Without a good book you’ll spend years trying to identify and decipher these phrases on your own. 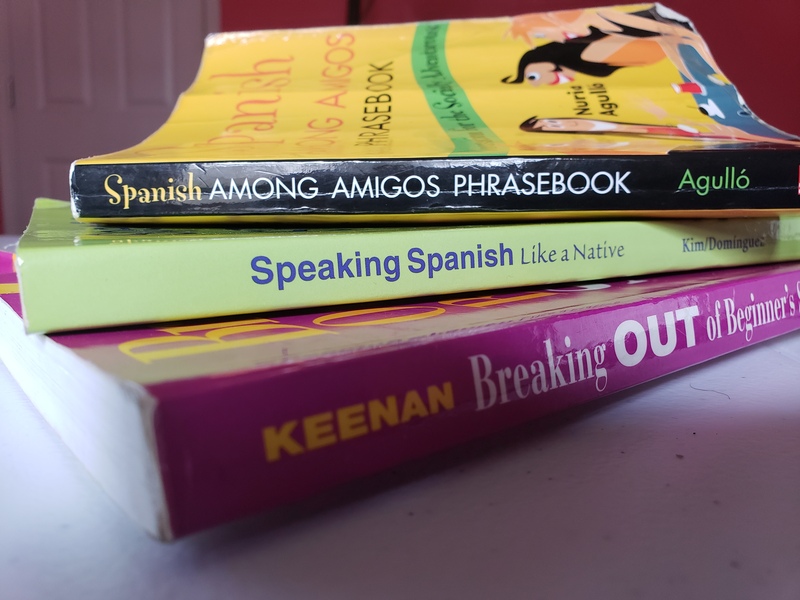 In this post I’m going to share with you 3 books that will help you make dramatic improvements to your conversational Spanish skills. Here’s a list of the books, all of which are available on Amazon. Lets discuss them one by one, in no particular order. If I could only recommend one book to improve your conversational Spanish, it would be this one. Breaking out of Beginner Spanish is indispensable, a must have for anyone who wants to be able to not only speak Spanish, but to do so as naturally as any native Spanish speaker. It’s one of the few learning Spanish books that I have honestly read from cover to cover and consistently use as a reference. It’s easy to read, entertaining and informative. It’s not very often you find all three of those qualities in a language learning book. 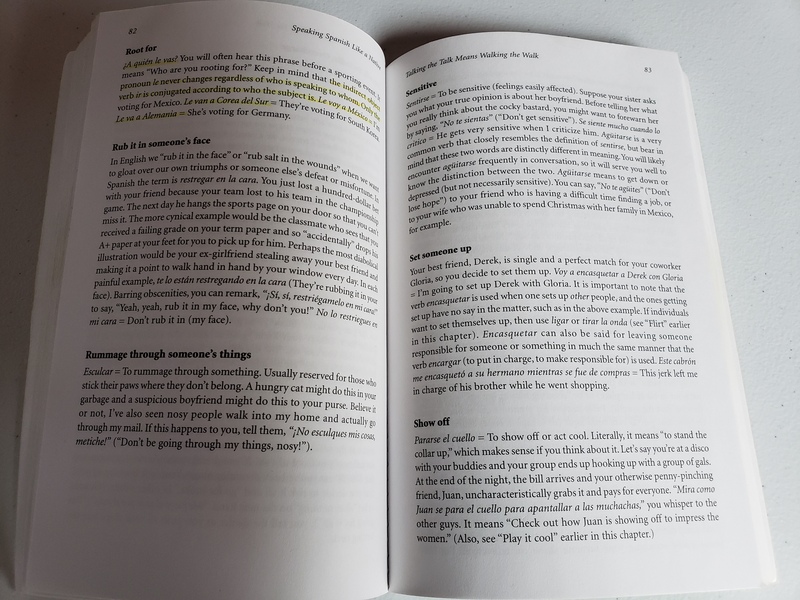 Let me point out a few areas of the book so you can get an idea of how it will help you improve your Spanish. Let’s start with the section on Meetings and Greetings that you’ll find in Chapter 2, Mind Your Verbal Manners. 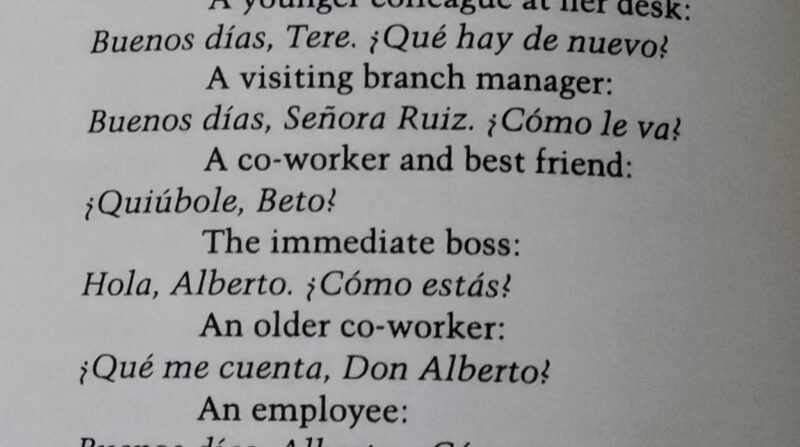 The author (Joseph J. Keenan) lists numerous greetings in Spanish beyond the typical “cómo estás” that you’re taught in the class room. 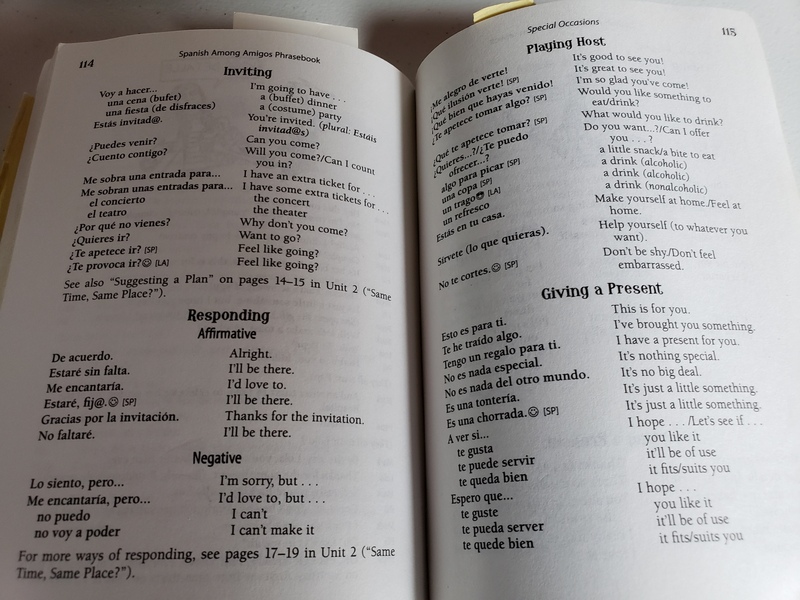 This section addresses a lot of the nuances of greeting people in Spanish, putting it all in context and providing much needed insight into the language that is missing from the class room. Take a look at the following pictures. 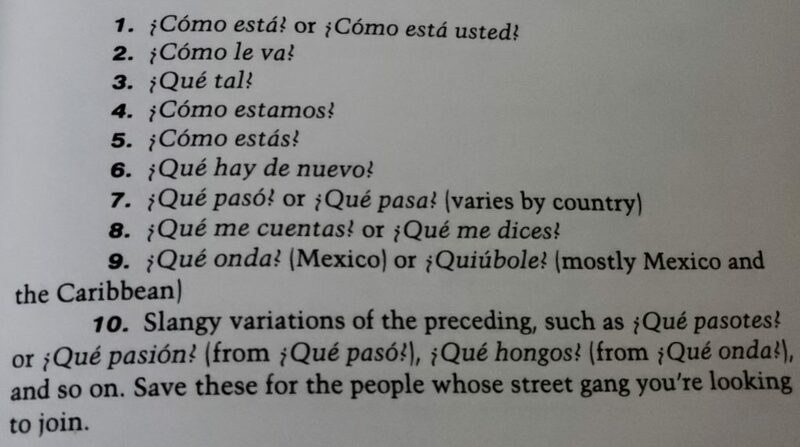 The first one is a list of common greetings and the second explains who it’s appropriate to use each greeting with. This is good example of where he points out nuances and culture in the use of the language that makes this book the tremendous resource that it is. Next let’s take a quick look at Chapter 7, Sixty-four Verbs, Up Close and Personal. 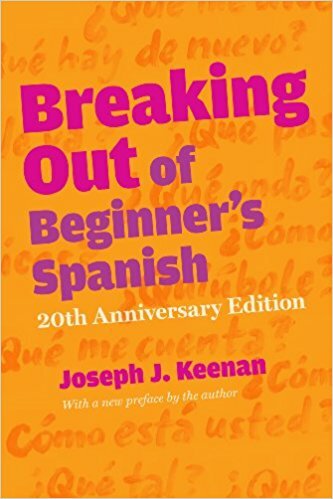 As the title of the chapter implies, he looks at 64 high frequency Spanish verbs. Here’s a partial listing of the verbs he covers: caer, andar, conocer, dar, dejar, echar, hacer, haber, llevar and ir. He explains the usage of these 64 verbs beyond the basic definitions you learn in class or your typical grammar book. 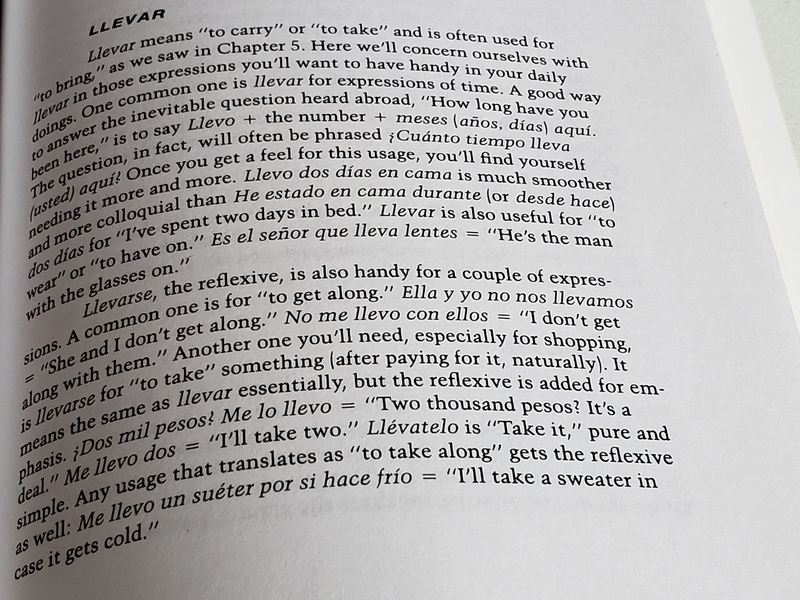 Here’s a snapshot of the paragraph on the Spanish verb llevar. I could go on for quite a while about the contents of this book, but I’m going to wrap this up by saying that this book will help you avoid common mistakes by English speakers, help you learn how to think in Spanish and sound less like a gringo by teaching you real world Spanish. I love this book and have definitely gotten my return on investment multiple times over. If memory serves me correctly, this is the first book on conversational Spanish I ever purchased. I just happened to come across in it a Borders bookstore (anybody remember those?). I glanced through it and immediately knew I had to add it to my collection. 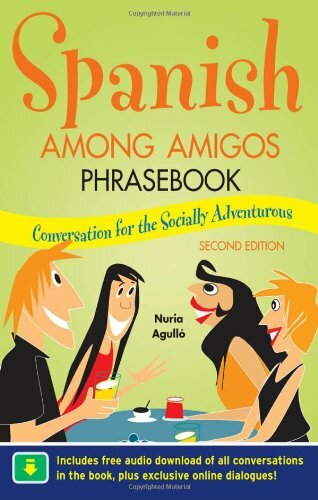 The Spanish Among Amigos Phrasebook has 12 realistic conversational dialogues and thoroughly covers the language structures, verbs, informal speech, slang, cultural insights and grammar. 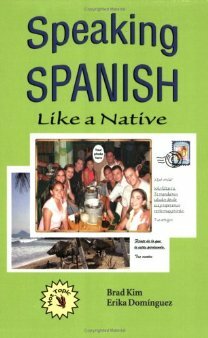 Much of the slang and informal Spanish focuses on the Spanish of Spain, but a lot of it is universal and if not, the author suggests Latin American alternatives. It’s another one of my favorites that has gotten a lot of use over the years. The conversations are sort of like a short story. They center around the activities of 3-4 main characters and revolve around the various topics of conversation and social activities of the characters. These dialogues are very much like those you might have with your friends. Here are a few snap shots from the book. Last and definitely not least is Speaking Spanish Like a Native. Honestly, when I first bought this book I glanced at it and said to myself, “ahhh, It’s alright”. I didn’t touch it again for I don’t know how long and when I finally picked it up again and really looked it, I realized what a fool I had been and how much time I had wasted. I think this book pairs well with Breaking Out of Beginners Spanish. 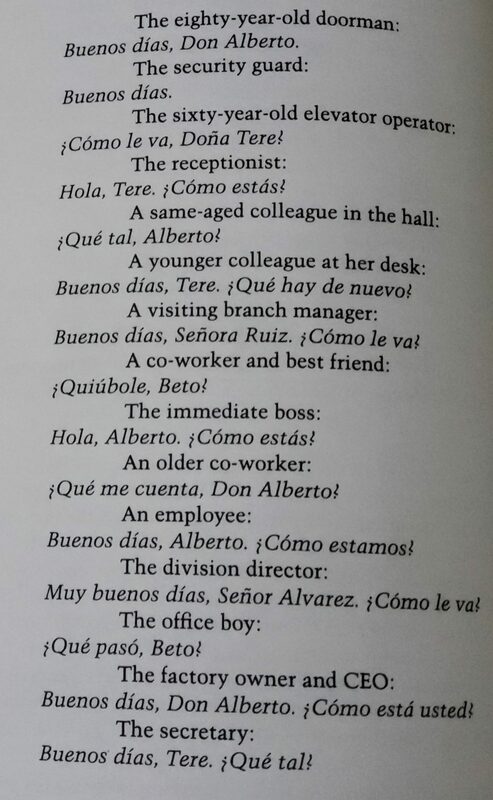 It has a similar format in that it teaches you how to say a ton of the everyday expressions we use in English in Spanish. The author puts everything in context, providing examples of when and how to use the various expressions and explains the cultural and social nuances of the language as well. Here’s snapshot of a page from the book to help you get a better idea of what to expect. 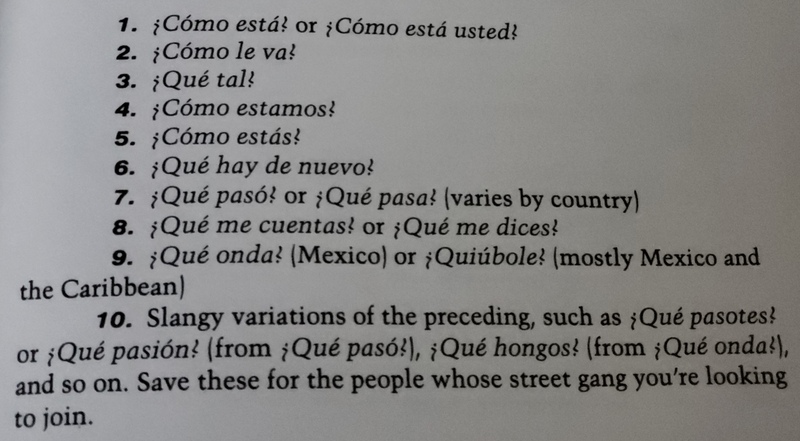 When it comes to slang, the book is geared toward Mexican Spanish, but everything else is pretty universal. I think you’ll find this book to be invaluable and well worth your hard earned cash. It will increase your knowledge of real world Spanish and make you sound more like a native speaker. And that’s it. I think you’ll find that all of these books will take you beyond the classroom and help you get closer to your goal conversational fluency. If you have questions leave them in the comments and I’ll try to answer them. Do you have any of these books? Share your opinions of them in the comments. And definitely comment if you have any books you’d like to recommend. And if you’re curious to know what other books I have my bookshelf, here’s a list I put together on Amazon.